The Perennial Plant of the Year winner for 2004 is the lovely Japanese painted fern (Athyrium niponicum ‘Pictum’). An attractive low-maintenance shade garden plant, this fern is also very showy. The leaves are a soft shade of metallic silver-gray with hints of red and blue. This fern thrives in part to full shade where moisture and humidity are plentiful and the soil is compost-rich and woodsy. 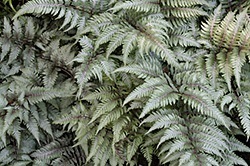 Hardy in USDA Zones 3 to 8, Japanese painted fern grows about 18 inches tall and makes a clump more than two feet wide. To keep the soil rich and fertile, mulch planting bed with 2 or 3 inches of compost or leaf mould each spring or fall. The fronds show their best color in light shade. The plant will tolerate a small amount of morning sun in southern gardens; in northern gardens it can take more morning sun without leaf scorch. Japanese painted fern makes for an interesting textural contrast when combined with other shade-tolerant perennials. Attractive companions are bleeding heart, columbine, Lamium, Astilbe, Hosta and coral-bells.